e probably peaked on Hotel California, " Don Henley assessed in an interview with Robert Hilburn of the Los Angeles Times. Joe Walsh agreed, admitting the album's success "made us very paranoid. People started asking us, 'What are you going to do now?' and we didn't know. We just kinda sat around in a daze for months." Glenn Frey declared, "Everything changed for me during The Long Run. There was so much pressure that Don and I didn't have any time to enjoy our friendship. We could talk about girls or football for awhile, but it wouldn't be long before we'd remember that we had to make a decision or that we had to get another song written for the next album." 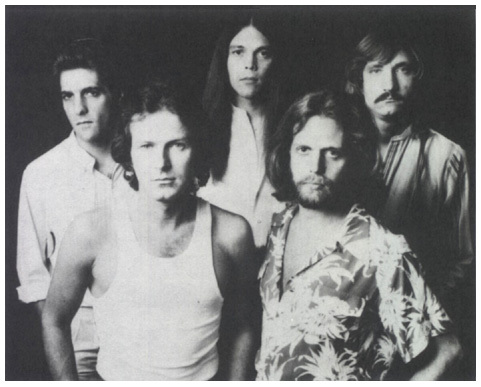 To try and inject some freshness into the sessions, the Eagles broke in July, 1978, for a short tour, then recorded a seasonal single, a cover version of Charles Brown's "Please Come Home for Christmas," backed with the original "Funky New Year." It was released in November. The competition for self-expression was so intense, they nearly issued a double album. "We actually did about 18 songs before we honed it down," Frey revealed in Musician. First charting on October 13, 1979, "Heartache Tonight" was the Eagles' 14th Top 40 U.S. hit and fifth and final number one single. It was the lead single from their sixth studio LP, The Long Run, which first charted on October 20, 1979, and stayed on the charts for 57 weeks during which it reached the number one position for nine weeks. It was certified platinum by the R.I.A.A. on February 1, 1980. The first of three singles pulled from the album was "Heartache Tonight," written with assistance from friend J. D. Souther and Detroit's soulful rocker, Bob Seger ("Night Moves," "Still the Same"). It was the fastest-rising Eagles single ever, debuting at number 52 on October 6, 1979, and moving 52-15-9-7-2 to number one. It was the fifth and final chart-topper for the Eagles. Like The Mary Tyler Moore Show, the Eagles kept their vow to quit while they were on top. Frey explained their break-up in the Los Angeles Times, "I knew the Eagles were over halfway through The Long Run. I could give you 30 reasons why but let me be concise about it: I started the band, I got tired of it and I quit." Each member has since issued at least one individual work, with varying degrees of acceptance. Ever the joker, Joe Walsh announced his candidacy for President in the 1980 election, prior to the release of his There Goes the Neighborhood LP and a solo tour. Felder contributed the title song to the soundtrack of Heavy Metal, then concentrated on his Airborne album. Timothy B. Schmit recorded a cover version of the Tymes' "So Much in Love" for the soundtrack of Fast Times at Ridgemont High, then recorded the Playing It Cool album. Henley's first solo hit single should have been "Johnny Can't Read" from his 1982 I Can't Stand Still album, but it stalled at Number 42. "Dirty Laundry" did the trick, reaching number three in January, 1983. He switched from Asylum to Geffen, where his Building the Perfect Beast album yielded "The Boys of Summer" and "All She Wants to Do Is Dance," both top 10 singles. The Eagles were "a summer band... a young band that asked the questions our generation was asking," according to Frey. Henley, a bit more pragmatic, has the last word: "We might have had a lot of problems with the Eagles, but was also made some pretty good records." The five Long Run -era Eagles would agree to formally reunite in 1994, with Frey announcing "For the record, we never broke up, we just took a 14-year vacation" at their first reunion gig in April of that year. They also launched a reunion tour, which produced a live album titled Hell Freezes Over (named for Henley's recurring statement that the group would get back together "when hell freezes over"), which sold six million copies in the U.S. The tour was interrupted in September 1994 because of Frey's serious recurrence of diverticulitis, but it resumed in 1995 and continued into 1996. They were inducted into the Rock and Roll Hall of Fame in 1998, when all seven former and current Eagles members (Frey, Henley, Felder, Walsh, Schmit, Bernie Leadon and Randy Meisner) played together for two songs, "Take It Easy" and "Hotel California." On October 30, 2007, the Eagles released Long Road Out of Eden, their first album of all-new material since 1979. In March of 2008, they launched their world tour in support of Long Road Out of Eden at The O2 Arena in London. In February 2013, the band released a career-spanning documentary called History of the Eagles and began the supporting tour with 11 US arena concerts in July. On January 18, 2016, founding member Glenn Frey died at the Columbia University Medical Center in New York City at the age of 67. The causes of his death were rheumatoid arthritis, acute ulcerative colitis, and pneumonia while recovering from intestinal surgery. The band mounted another North American tour in March 2018, with Frey's son Deacon performing in Glenn's place, along with country musician Vince Gill.